I don’t know who coined that phrase, but whoever it was, must not have been referencing airplane travel! Obviously, flying is not my favorite thing to do. Oh, no! For as much as I love traveling — exploring new cities, savoring exotic cuisines, and hiking through different mountain ranges — I find flying tolerable, at best. However, over the years, I’ve realized that there are a few items I can pack that make any journey much more relaxing and enjoyable! Here are 10 must-pack, carry-on items for long-haul flights! This soft, oversized, cozy scarf is the one thing that I never travel without. Not only are scarves a quick way to dress up your travel outfit, but also they can be used as neck pillows, and even mini blankets! I used to carry on a travel pillow, but never again! That’s just one extra thing to carry and I find my scarves more comfy anyway! In other words, traveling with a scarf is 100% necessary. I always pack an extra change of clothes for my long-haul journeys — especially ones that include layovers. Packing a second outfit is always a good idea, just in case your checked luggage gets lost. But that’s not my primary reason for packing a secondary outfit! Just before I step on any airplane after a layover, I head to the restroom to change into some fresh clothes and wash my face, so I can feel somewhat better about my current situation. My go-to travel outfit is usually a cute sports bra, a comfy sweater, a scarf, stretchy yoga pants, and tennis shoes. These Neutrogena Hydrating Makeup Remover Cleansing Towelettes are essential to surviving a long-haul flight. I am a freak about keeping my skin clean and clear, especially while flying. These towelettes remove your makeup, while keeping your skin clear and hydrated! You will never, ever, ever catch me on a long-haul flight without these towelettes. Of course, most all airplanes have televisions now and a seemingly endless stream of movies. But what about when you’re sick of staring at the screen? Adult coloring books are all the rage right now — and I am in love with Lonely Planet’s Ultimate Travelist Coloring Book. This coloring book features 100 intricate drawings of the world’s greatest destinations, perfect to inspire your current and future travels! Fantastic Cities and Gulliver’s New Travels are two other awesome travel-inspired coloring books. Also, make sure to purchase travel guidebooks and novels related to your specific destination! Noise-cancelling headphones are another must-pack item for long-haul flights! These lovelies block out all outside noise, so you can focus on your movie, your music, or the back of your eyelids. They’re ultra-comfy and the sound quality is top-notch. Of course, you can’t board any long-haul flight without your travel-sized toiletries! Staying hydrated on a long-haul is super important, if you want to beat jet lag and feel good. And trust me, you do! Water bottles cost a fortune inside the airport, and throwing away all that plastic isn’t good for the environment either. Get yourself a good-quality reusable water bottle that you can fill up, again and again, once inside the airport. Then, during your flight, instead of getting one tiny plastic cup of water, you can ask the flight attendant to simply fill up your water bottle! Just like water bottles in the airport, buying snacks in the airport — or aboard an airplane — is expensive. Some of my favorite snacks to pack are fresh fruit, trail mix, Clif Bars, beef jerky, and my mom’s awesome banana bread. The last thing you want is to get sick while traveling! Since airplanes are full of nasty germs, you should protect yourself with a little bottle of hand sanitzer. I never go anywhere without this stuff! 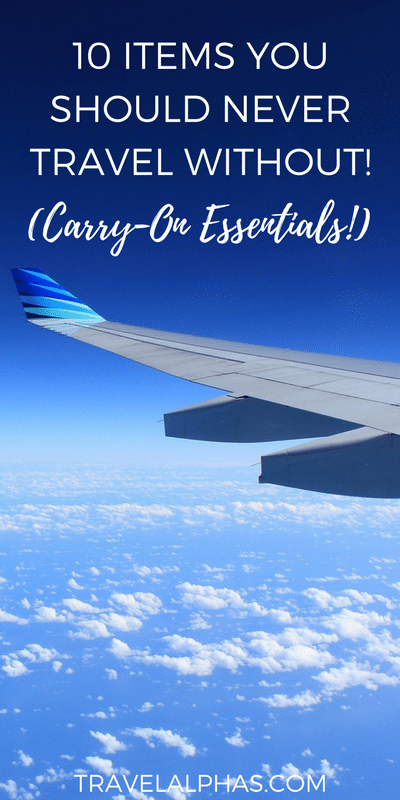 What are your must-have carry-on essentials? Do yours differ from mine? This post contains affiliate links. If you make a purchase through a link in this post, we will receive a commission, at no extra cost to you. Thank you for supporting Travel Alphas! Yes! Scarves and re-usable water bottles are so important. Bottled water is so expensive these days! True story: I’m always to not-so-cute traveler who wears those giant compression socks on long-haul flights. They keep my ankles from swelling up, so they’re 100% worth it. Great list! You definitely hit on the essentials! Yes, I agree that some of those things are essential. I remember traveling without anything when I first started traveling years ago and now I am a savvy traveler specially when you travel with two toddlers. You must have your hands full traveling with two toddlers! Wow!